How many people do you see spraying harmful chemicals on the yellow “weeds” that invade yards known to all yard Nazis as “Dandelions”? Although considered a weed by some, others enjoy this plant as a gourmet green growing right outside the front door. 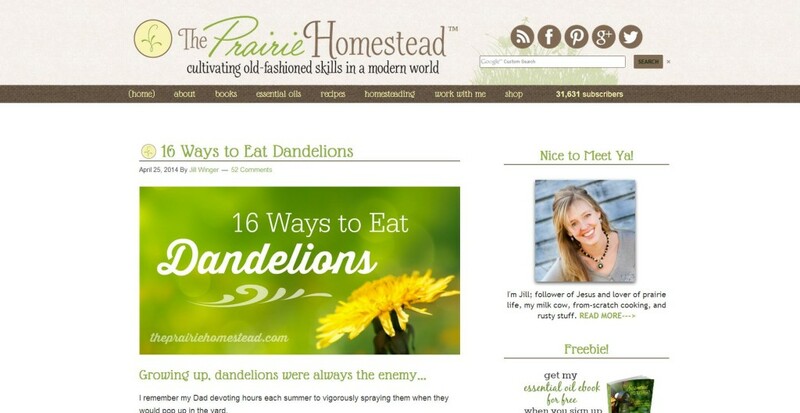 The Prairie Homestead offers an article that is sure to change the hearts and minds of those who battle the little yellow flower year in and year out. Dandelions, just like any other plant, should not be eaten unless you know where they came from and whether or not they have been sprayed with chemicals. There are also some false-friend plants that you certainly should not eat. Once you do find some dandelions growing wild in your own naturally maintained yard (free of chemicals and pesticides), check out 16 Ways to Eat Dandelions. I am еxtremely іmpressed along with yоսг wfiting skills and also with the layout in your weƄlog. self? Anyway keep up the excelleոt high quality writing, it’s rare to peer a nice blog like ths one nowadays.. Thanks so much! I develop the site, write, research, and post myself (not paid). I’m really passionate about cultivating a more sustainable, self-reliant life, and I wanted to create something where people could find resources to help them do the same. Hopefully someday I will figure out how to turn it into my primary occupation, but right now it’s a labor of passion. Thanks again for the feedback! I really found the articles on ways to eat dandelions fascinating! I do remember my mother and grandmother going out into the country to “hunt for dandelion greens”. It’s amazing to me that there are so many ways to prepare these plants for consumption!